Ever felt like you've conquered something so monumental that it's like reaching the top of Mount Everest; flying to the moon and back; inventing something that will change the entire course of human nature? Well this is how I feel today as I am sitting here writing this. After completing what I will say is the finale to my own take on the well treaded trilogy path, like 'Lord of the Rings','The Godfather', etc. If you have been following my last couple of postings, you will know that I have been re-living my childhood life through comfort food from Singapore of late. It all started out with my sudden crave for the Singapore Hainanese Chicken Rice, and then I attempted on the Singapore Chilli Crab which I had to substitute with prawns due to the lack of live crabs crawling around my local fish market. 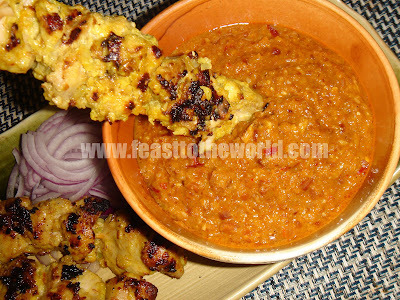 Now this is another particular favourite of mine, the Satay. I can remember many happy evenings, or should I say in the early mornings, spent savouring this irresistibly smoky and sweet meat morsels on a stick in Lau Pa Sat back in Singapore, which is without a doubt, the best place to enjoy this dish. If you ask any Singaporean, they will more likely than not to agree with me on this. Lau Pa Sat is situated right in the middle of Singapore business district. The entire stretch of road is closed to the traffic at night and stalls will be set up along the road, all selling the infamous satay. Tables and chairs are also laid out for the diners and what you get is this beautiful ambience, being surrounded by all the dimly lit buildings and street lights. Something rather charming about these. Just imagine if they do the same here in Canary Wharf, how amazing will that be! By the way, for those who has never been to Singapore, just take a trip to down to Canary Wharf, and let me tell you, Singapore is exactly like it, well, almost. 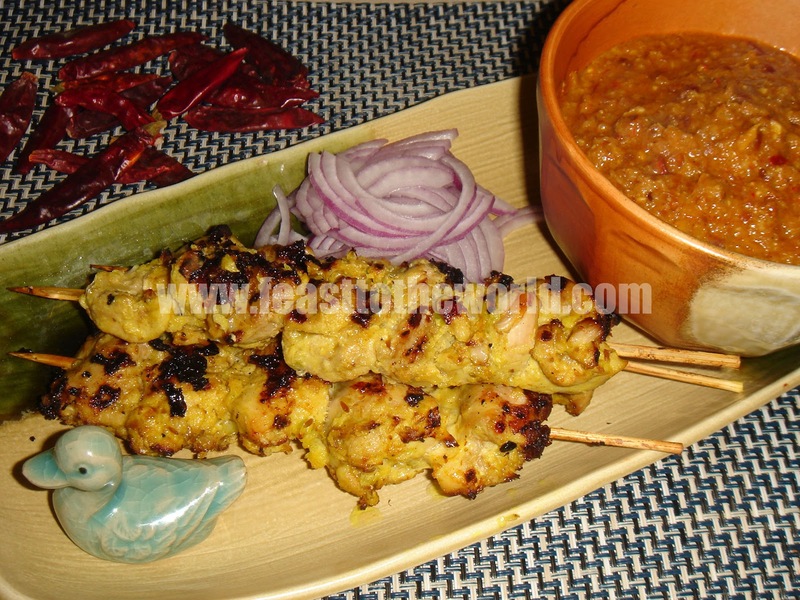 A selection of meats can be used for this Satay, chicken, pork, beef, mutton etc. Traditionally, these are then marinated in a piquant marinade and then barbecued over hot charcoals which was what I initially intended to do, however, the weather outside on the day has gone against my wish and the glorious sun was nowhere to be seen. Cloudy and gloomy sky had forced me to cook this indoor instead. But fret not, I did have a heavy cast iron griddle pan which I heated till it's hot and smoking and the ending result was just as irresistibly smoky and savoury. Do not be alarmed by the sheer number of ingredients and steps on the list, these can all be prepare in advance which make this is a great dinner party dish to impress your guest with or a lovely weekday supper after work....stress free. Soak the bamboo skewers in cold water for at least 1 hour, this prevent them from burning when cooking later. 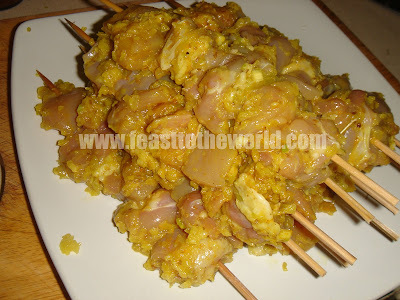 Cut the chicken into small bite size, roughly 2cm cubes.Put all the ingredients for the marinade in a food processor and pulse to a paste. (I have done this in a mortar and pestle, which is the traditional method but this is much quicker and easier). Combine the chicken with the marinade in a large bowl and let that sit for at least 4 hour, preferably overnight if you can, for the flavours to fully permeates the meat. 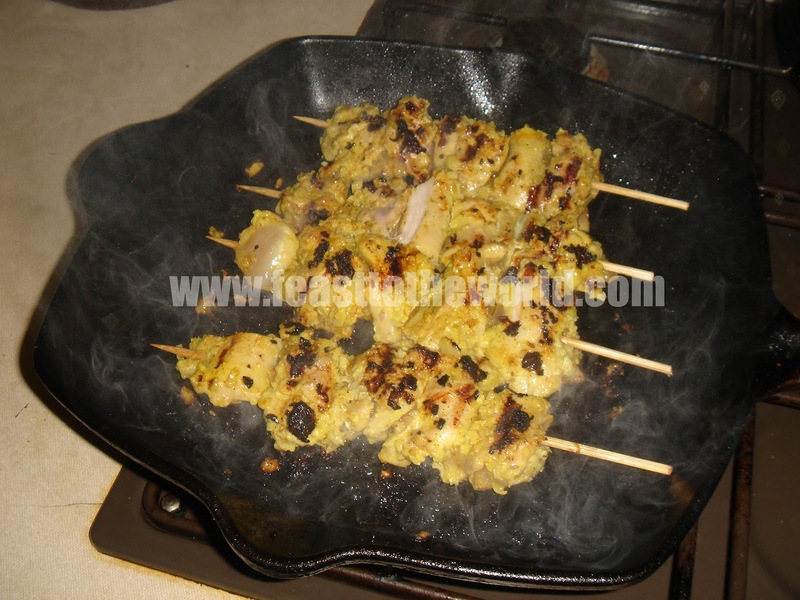 Thread 4-5 pieces of chicken on each skewer through the pointed end, pressing them tight. Do this until all the chicken has been used up. Set aside while you get on with the peanut satay sauce. 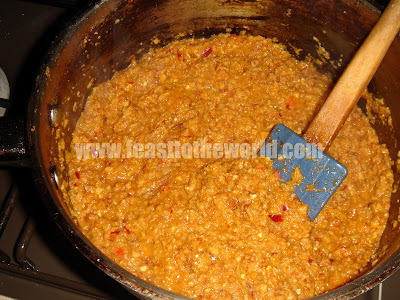 For the satay sauce, put all the ingredients for the spice paste in a food processor and pulse into a paste. Heat the oil in a medium pan over night heat until smoking. 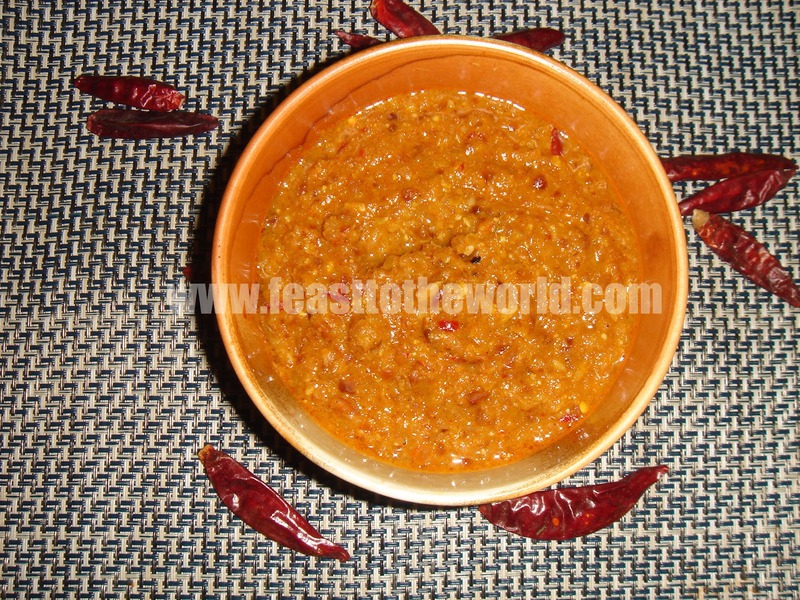 Cook the spice paste for 1 minute, until fragrant. 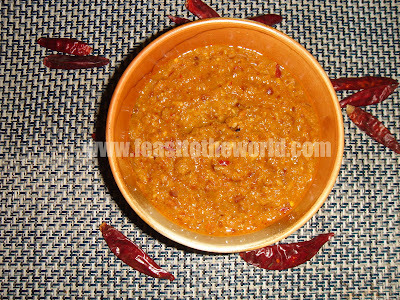 Add the tamarind purée, chopped peanuts and water. Bring to the boil and simmer for 10 minutes, until the sauce has reduced and thickened. Add the sugar and season with salt to taste. The chicken can now be cook either over charcoal( BBQ style, which is the authentic way), under a hot grill, or on a very hot and smoky cast iron griddle pan for 5-6 minutes each side until cooked. To serve, arrange the satay on a plate, along with the onions and cucumber, if using, with a bowl of the peanut satay sauce for dipping on the side.